This top quality villa enjoys beautiful sunrises and panoramic sea views to the bay of Palma and is located in Bendinat within easy walking distance to the nearby shops, the gym and the hotel Lindner Golf Resort Portals Nous. The property with a generous 95 m² swimming pool and extensive terraces is very private and built on 3 levels with 7 bedrooms and 6 bathrooms, one bedroom is assigned as an office. Designed with style and a very open distribution, the property has 2 entrances, the most impressive is by car via the private tunnel into a spacious garage for several cars. The upper level has a beautiful master bedroom with incredible sea views, a private terrace, a dressing room and a large bathroom en suite. In addition, there are 2 bedrooms with bathroom en suite, a further double bedroom, an office and a separate bathroom. Exclusive features include a grand wine cellar, KNX/ Alexa home automation, LED light technic, Denon sound system, solar system, water filtering system and a Gaggenau kitchen. In addition, there is air conditioning hot/ cold, underfloor heating, stone floors, satellite system, separate laundry room, an auxiliary kitchen, lift and a fireplace. 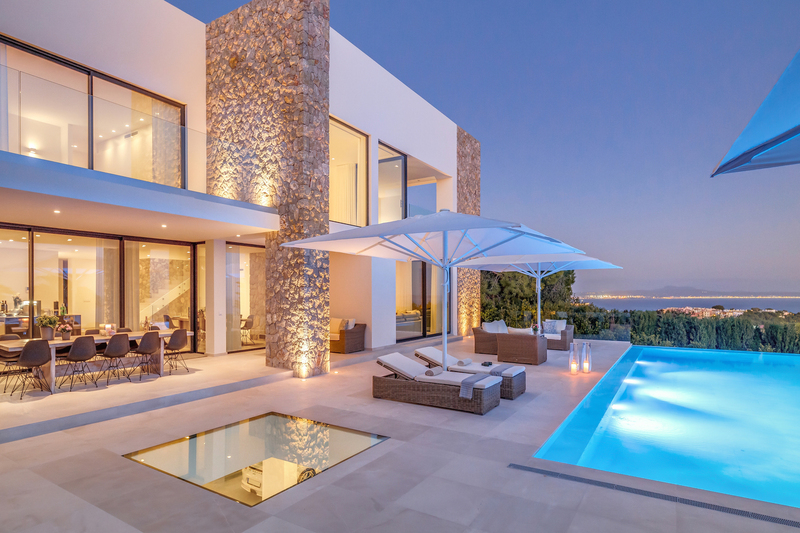 We invite you to come to Mallorca and visit this new quality villa.